Often times when working with a variety of different publishers you find yourself having the same field of data coming in to your system on different headers which can cause a huge issue when posting out. For example, for the “firstname” field, you may get many different variations of the headers posting in; “firstname, fname, first, first_name, name” however when it comes time to map this field on an outgoing campaign you can only choose one for the firstname field that providing to your client. 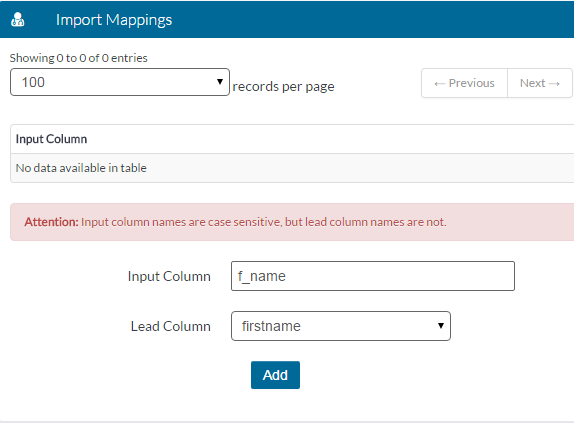 To avoid missing out on sending any firstname data in various other formats we highly suggest utilizing our import mapping sections in your platform, located under the Administration tab of your navigation bar. To add a new import mapping you will first need to type how the data is being posted in under the Input Column, and then select the Lead Column you wish this data to be mapped to and click the Add button. In the above example we mapped the data coming in as “f_name” to store under the “firstname” column. You can map as many fields coming into the Input Column to the same Lead Column.